Learn how elite athletes like Michael Jordan, Sandy Cofax, Tom Glavin, and Pedro Martinez, deal with pressure. In his 15 years as a major league pitching coach, with "Moneyball" Oakland A's, NY Mets, Milwaukee Brewers and Baltimore Orioles, Rick Peterson has coached Hall of Famers, Cy Young winners, and many other elite athletes. In this book, he and bestselling author and leadership expert, Judd Hoekstra make this skill available to everyone. 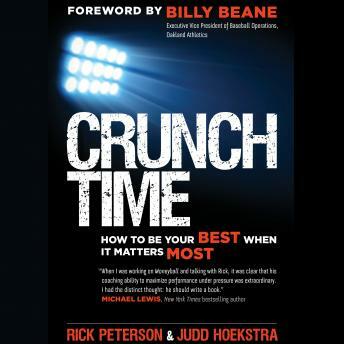 From an insider's perspective, learn how you too can become a Crunch Time performer and perform your best in all situations. With fascinating behind-the-scenes examples from some of the top names in sports and business, Rick and Judd offer six powerful reframing strategies to help you see a pressure situation with a new perspective so that it shifts from a threat that can make you panic to an opportunity for you to shine. With a Forward by "Money Ball”, Billy Beane, EVP, Oakland Athletics.